You know if you have been reading this blog site for awhile that I’m all into being practical and creating things I need. 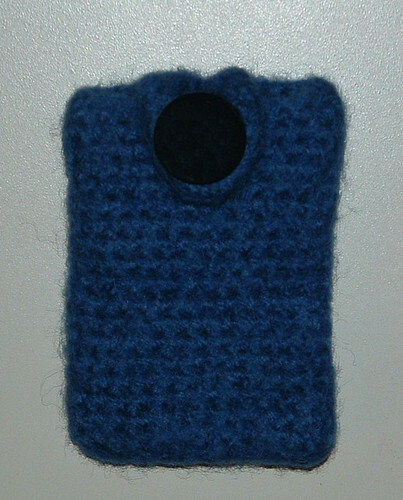 So I really wanted to have a nice little cell phone holder and I just love felting so I crocheted myself this little cell phone cozy from some scrap wool yarn. Crochet this cozy using about an ounce of 100% wool yarn with a G (4mm) crochet hook. Chain 14, single crochet (sc) in 2nd stitch from hook and in each stitch down to end of chain (13 sc). Working around the back side of chain, sc in each stitch to create a seamless cozy. Do not join. Continue working in rounds until your cozy measures 4-1/2 inches long before felting (approx. 19 rounds.) Slip stitch into last few stitches of final round so your finished edge is smooth. Fasten off and weave under ends on the inside of your cozy. Finished size before felting was 3-1/2 inches wide by 4-1/2 inches long. Join yarn with slip stitch in 5th stitch from edge and ch 15. Attach in the 2nd stitch over from loop base to create the buttonhole with a slip stitch. Then Sc back up the chain evenly (approx. 18 Sc’s.) Join with slip stitch back into the beginning with a slip stitch. Finish off and weave under ends. Place your completed cozy inside an old pillowcase and tie it closed with a knot. I felted my cozy 15-20 minutes on the hottest water. Check your cozy after 10 minutes of agitation to make sure it hasn’t felted too much to fit your cell phone. Mine needed more so I put it back into the washer. After a total of 20 minutes, mine was perfect. I pulled it out and cold water rinsed it in my sink. Shape your cozy so it’s square and check to make sure the opening is wide enough to insert your cell phone. If it’s a bit tight, just stretch the opening a little. Air dry and shape as it dries if needed. My final felted cozy measures 3 inches wide by 4 nches long which fits my Motorola cell phone that is 2-1/4″ wide by 3-3/4″ long. This cozy is a great way to use up scraps of wool yarn you may have on hand. Just make sure you use 100% wool so your project felts properly. Once your felting is done and its dry, add a 1 inch or larger button as desired to the front of the cozy. 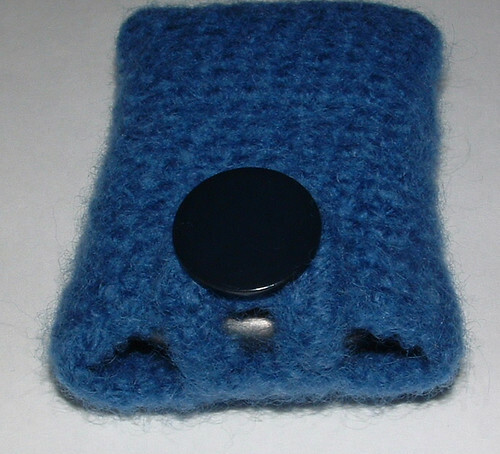 Voila you are done — Enjoy your felted cell phone cozy!